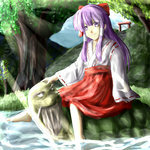 Turtle familiar of Hakurei Reimu. In earlier Touhou games, she used his powers to fly, later she develops her own flying ability and Genjii no longer appears. His form is that of a turtle with prominent, gray eyebrows and beard.